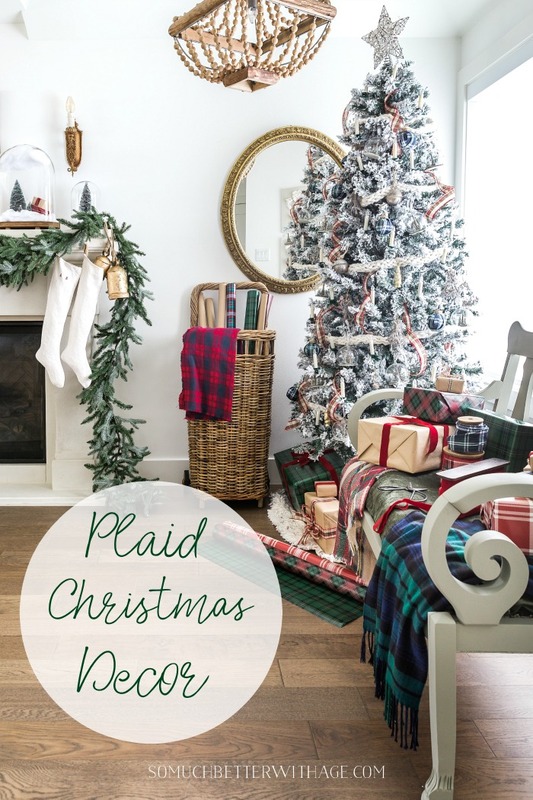 Plaid Christmas decor is so pretty with plaid presents, ornaments and blanket inspiration. 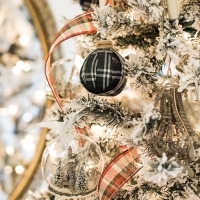 This neutral loving girl is branching out with her Christmas decor this year and adding plaid! 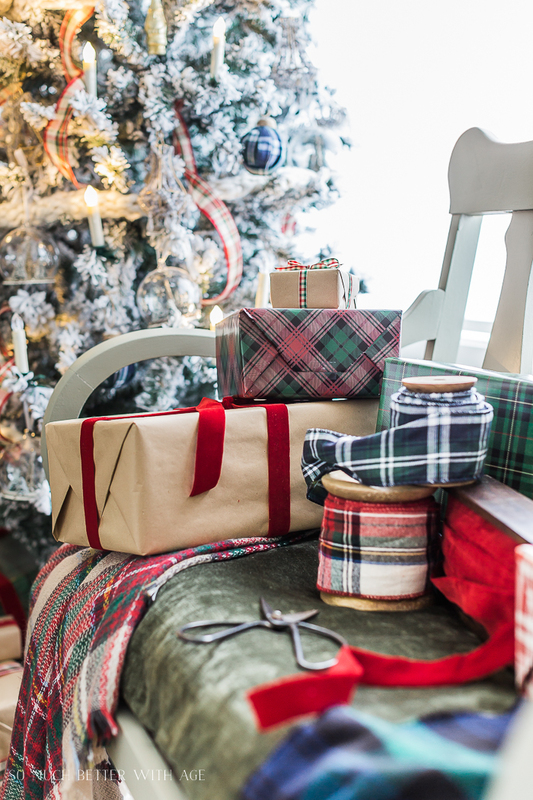 I loved adding these plaid elements to my tree, mantel and gift wrap gaining a lot of inspiration from beautiful plaid throw blankets. 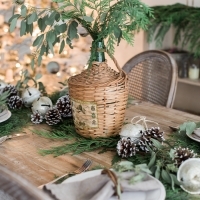 Today I’m taking part in a Styled + Set holiday entertaining tour hosted by Lory of Designthusiasm. If you are coming here from Dimples and Tangles, welcome! Be sure to visit all the other tours at the end of this post. If you’ve been following me on my Instagram stories, you might have seen how I’ve been giving this old settee a makeover. It was so tattered and old but I knew it would look amazing next to the tree this year. And adding green velvet fabric makes it so luxurious. I like to challenge myself each year to stick to my same Christmas ornaments and general decor but to change it up a bit. 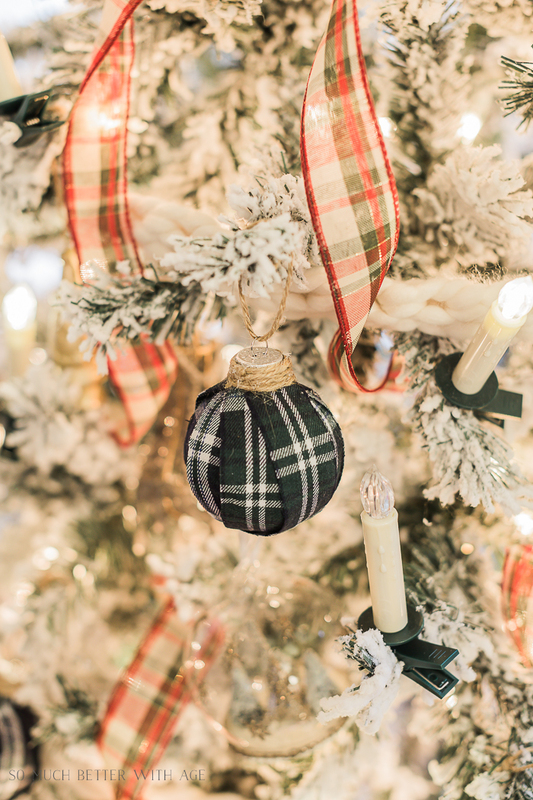 By using my same ornaments but just adding some plaid ribbon, a few plaid ornaments (I’ll be showing you how I made them tomorrow!) 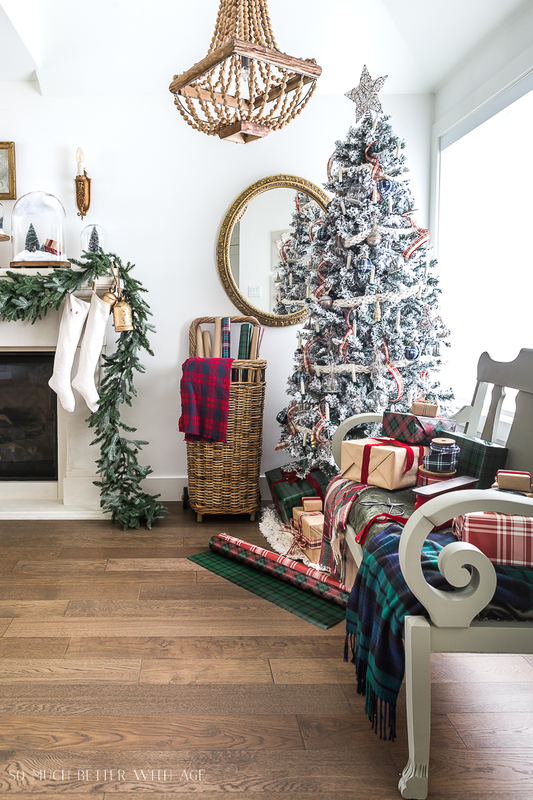 and adding some plaid throws and plaid wrapped gifts, it’s changed the whole look from last year. I love these battery operated candle lights. There are no wires as each light needs one battery and they go on by remote. They can be clipped anywhere and they even flicker! These new plaid ornaments I recently made. You can find the tutorial here. I also love using our Tree Mote to turn the pre-lit Christmas tree lights on too! I hope you enjoyed my plaid Christmas decor in the living room. 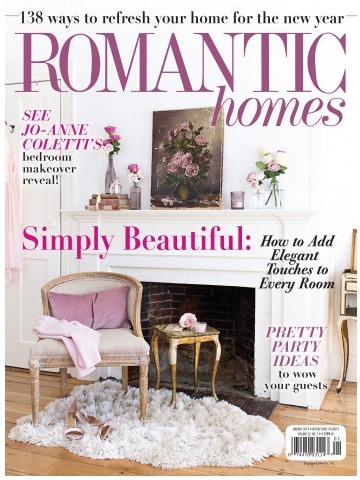 Head over to Jennifer at Town and Country Living to continue the tour. Your tree and everything looks so pretty and festive. My house is very neutral as well, but when it comes to Christmas, I do love to stick with traditional Christmas colours. 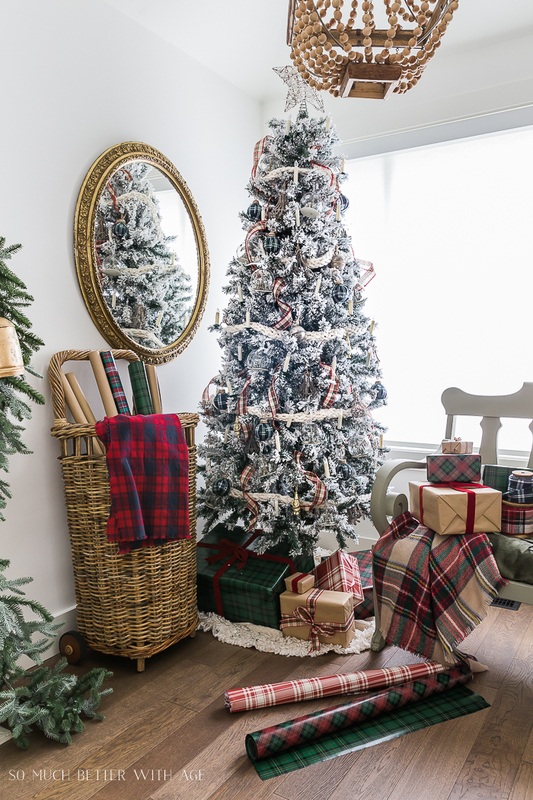 My question though for this year….is it “ok” to mix plaids in one room? 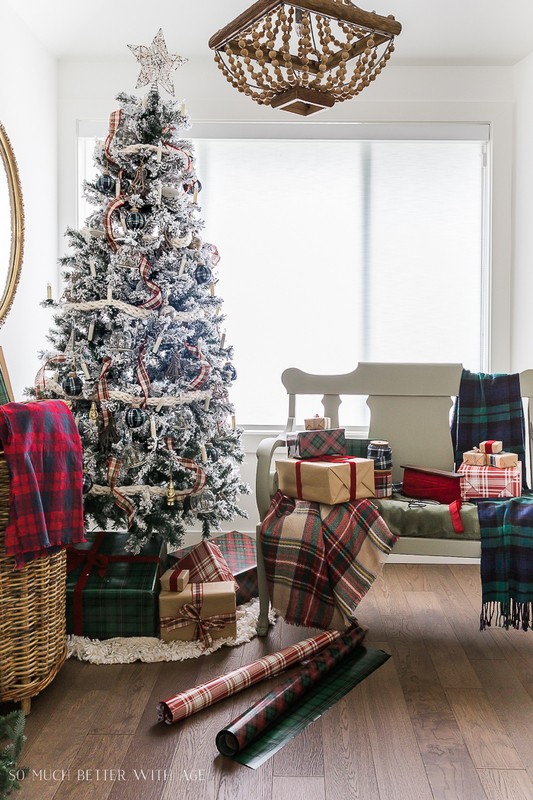 I’m very attracted to plaids this year and I notice that you have several different plaid throws, but I’m wondering ..is that ok all in the same room? I have several plaid throws but I’m just so unsure! Help! Thank you Colleen and yes, feel free to mix plaids in one room. I have 3 different plaid throws in just my living room. I love plaids this year too. Everything looks amazing…I, too am using a little bit of plaids…did last year, too. 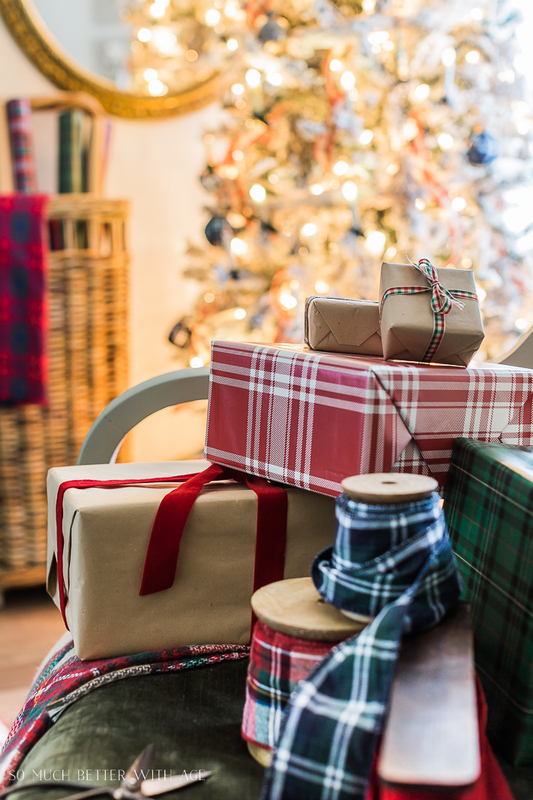 I do want to get some plaid wrapping paper….I love your basket on wheels and went to the site you mentioned…didn’t show one. Thank you, BJ! 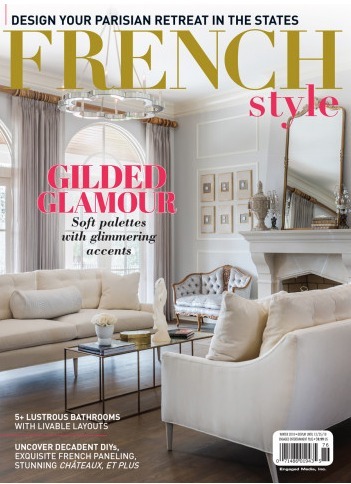 I noticed Lidy (French Garden House) doesn’t have that basket on her site anymore. I’ll ask if she’ll be getting again soon! Quite a different look that i love, and that bench really makes it all so wonderful. Thanks for sharing. Thanks so much, Marlene! I love the bench too. Jamie, this is beautiful!! And I just printed out the European Christmas Stocking Pattern…I CAN’T WAIT to make these 🙂 I’m ordering the drop cloth tomorrow, and will hopefully get these done by next week. 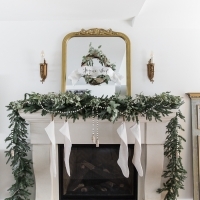 Your Christmas mantle with these stockings is stunning. Thank you so much for the pattern and for the inspiration. Please keep the posts coming, and have a very Merry Christmas!! YAA!! I’m so glad you are going to make the stockings! I love them so much! 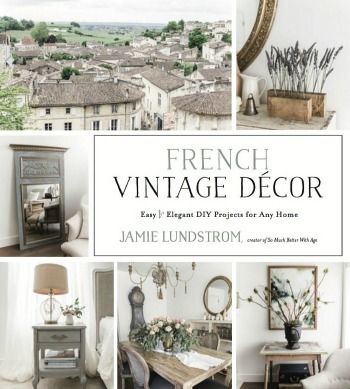 Jamie, This is absolutely beautiful!! I love the warmth of the plaids and how honey it all looks!! Thanks so much, Lory! Definitely different for me but I love it too. Your decor is gorgeous, Sheila! I know, it was difficult for me but I’m loving trying something new this year (new for me, haha). Thank you so much, Tamara! Merry Christmas! 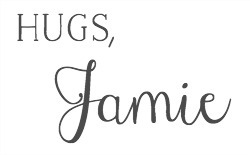 I love how you mixed all the plaid patterns Jamie! 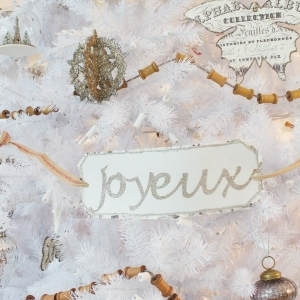 So festive – your tree is stunning! Love the pops of color the plaids have added. It creates such a warm and cozy feeling. 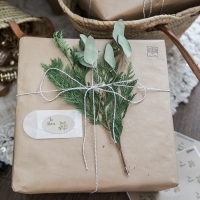 This post is a Feature pick for the new Merry Monday party. See ya there. Merry Christmas!